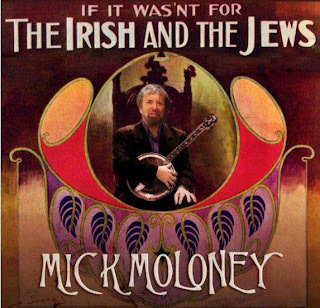 Last October, Moloney completed an album celebrating these Irish-Jewish relationships both within his own life and in American musical history. Growing up in Limerick, Moloney says, he knew “very little” about Jews or Jewish culture. He met Jewish people for the first time while at college in Dublin, and later learned that Limerick was one of few Irish cities ever to have a pogrom, in 1904. Moloney sees this project as “turning the circle, as it were,” celebrating Irish-Jewish cooperation. “If It Wasn’t for the Irish and the Jews” includes 14 songs, all researched and performed by Moloney, and products of the fruitful and nearly forgotten era of collaboration between Irish and Jewish songwriters in New York’s pre-World War I Tin Pan Alley. Between 1880 and 1920, waves of immigrants from Eastern and Southern Europe shifted the makeup of New York City and its entertainment industry. In 1880, Irish immigrants made up one-quarter of New York City’s population and dominated the popular minstrelsy, variety theater and vaudeville scenes. First the Irish took to the New York stage and later the Jews did so, partially because of limited job opportunities elsewhere. The two groups were living on the fringes of society and in close quarters on the Lower East Side, where they often clashed along the rocky road to acceptance into mainstream American society.